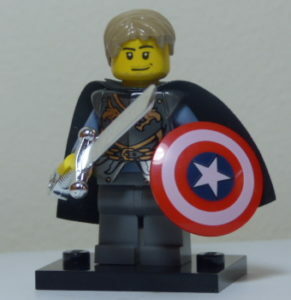 I know that the image of Captain America is enshrined in the ideal that his shield can be used on any occasion, for any necessity and that therefore another weapon is almost an apocryphal thing for him to hold. And while i’d be inclined to agree, for this figure we also needed to bear in mind that this wasn’t a Captain America we were creating but a Captain America Warrior. The result is what you see. Pehaps it is the photo and no hand customisation went into creating this one but I just liked the feel of the figure, maybe it’s the angle of the cape or the shine of hte sword, but I think it has a somewhat noble bearing which is quite appealing. Anyway, i’ve here included it mainly because it looks cool and is a different take on a warrrior, albeit perhaps slightly contradictory.